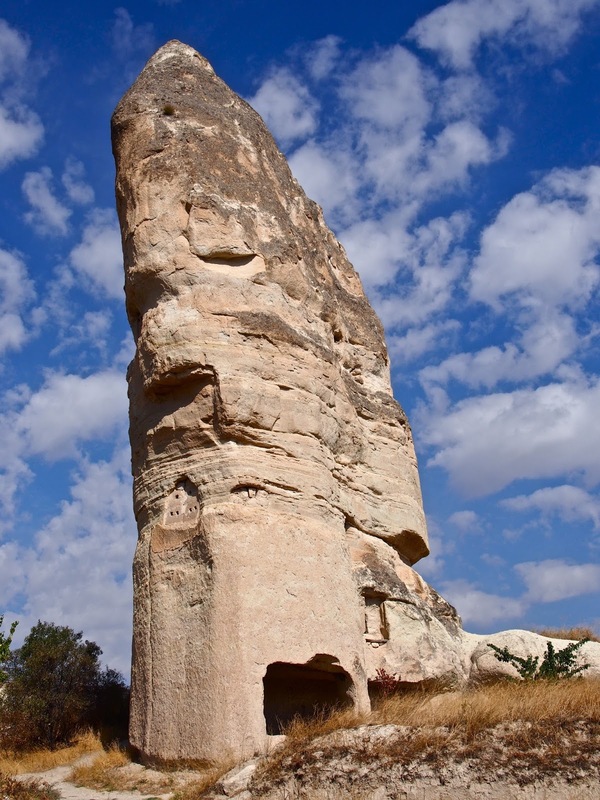 While the most famous way to see Cappadocia is via hot air balloon, there's a lot to be said for taking the land route as well. There are cave cities to be explored, hikes through phallic valleys, and some surprisingly good food. Goreme is a small town and we weren't expecting much from the food scene, but Isabel had done her research (as always) and recommended a humble-looking place near our hotel for dinner. The main attraction was a dish called testi kebap, a Cappadocian specialty. Chicken (or lamb) and onions and peppers and tomatoes are cooked inside a small, sealed clay pot which then gets cracked at your tableside when you're ready to eat! For 40 TL ($13) a piece, we each got lentil soup, yogurt dip, an unexpectedly delicious salad with dill dressing, testi kepab and a glass of Cappadocian wine! It came along with an inexplicable - but not unwelcome - Tracy Chapman soundtrack. The next day we signed up for a private tour through our hotel. Hassan, the hotel owner's dad, shuffled Isabel and I into a minivan with Frank and Amy from San Francisco and took us to some of his favorite spots around the region. And a local ceramics workshop where I even got to take a turn at the potter's wheel! It seems I do not have much of a future in the ceramic arts, but it was a lot of fun. My favorite part - no surprise here - was an unplanned lunch stop. The tour was only supposed to last a half day, but it was clear that we'd be continuing well past lunch time and so when Hassan asked if we were hungry I did not hesitate to say YES. He took us to a restaurant he frequents in Nevashir and we filled our table with pide and lamb chops and salad and an unusual dessert called kunefe made out of cheese and vermicelli noodles soaked in syrup which sounds bizarre but is quite delicious. Pide - there's ground lamb and cheese in that 4-foot long bread boat. Top it with a squeeze of lemon, a pickled chili pepper and some fresh parsley. A big hunk of slow-roasted lamb, on fluffy bread, with half a raw onion (to aid digestion). Our first kunefe of the trip - but not our last. We confounded the staff by asking for Turkish coffee before the meal. Apparently, Turks only drink their coffee after eating - but we were tired! They humored us, while shaking their heads, and we assuaged them by having a second coffee after lunch. It was one of those unexpectedly perfect meals that you never want to end. Turkish coffee in the most gorgeous copper mugs. All in all it was a great way to experience a lot of Cappadocia in a short time - and a good thing, because we were off on a night bus to Antalya that evening! Getting there: We flew to Kayseri from Istanbul's Sahiba Goeken airport on Turkish Air for about $25. Seriously. The pre-arranged shuttle to the hotel was another $10-ish - there are several companies who do this, but be sure they match up with your arrival time. Where to Stay: We stayed at the Vineyard Cave Hotel, a really lovely family-run hotel- son Osman runs the business, and the dad Hassan was our tour guide and also cooked our eggs in the morning! 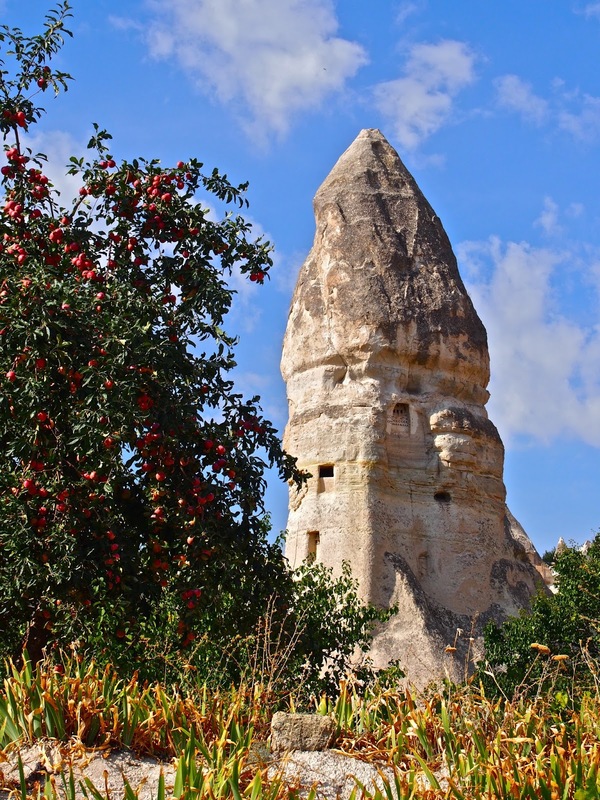 Where to eat: Cappadocian Cuisine has a great selection of local specialties, including wine from the region. There are other places in town to get fancier food, but for a simple and delicious meal, this is a really solid value. P.S. Photo credit for food pics, and the one of me trying to throw a pot, goes to Isabel! Mary- what incredible views. The sky is so blue & the structures amazing. I love the tapestry behind you in the pottery picture. Thanks for sharing.